When the summer sun beats down, a lot of Texans retreat indoors. During your typical Texas summer, hiking, camping, and many other outdoor activities just don’t sound like as much fun. But you can still get outside—even when daytime temperatures are at their highest. What’s the secret? Wait till the sun goes down. Check out this article to learn about a couple of cool ways to beat the heat. Now is the perfect time to take a bat-watching trip. 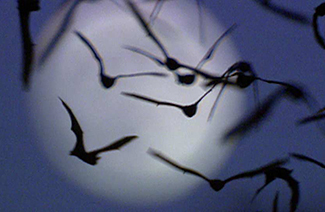 During August, the colonies are at their largest and the most spectacular bat emergences occur. This is because the young Mexican free-tail bats, which are the most common species in Texas, begin flying with their parents at night to feed. There are a lot of great spots around the state for bat-watching. There are some bat viewing guidelines and regulations to be aware of in order for you and the bats to have the best experience. Bats are protected by Texas law in their natural habitats, including bridges. You should never bother bats as disturbances can alter their emergence behavior and make them vulnerable to predators. Keep your distance from the bats. Do not shine any type of light at them and use a low voice as loud noises can disturb them. Never touch a bat if you find one on the ground. It could be a young bat learning to fly or it could be ill. Wild animals might bite when they feel threatened so contact the site’s manager, a volunteer, or a local animal control office. A. Bamberger Ranch Preserve: Reservations are required. The schedule will be posted once it is finalized. The cost is $7 per person. 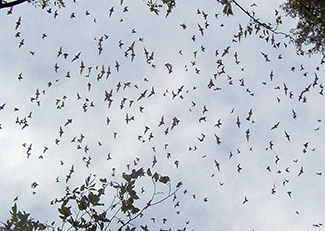 B. Bracken Cave Preserve: This is the largest known bat colony in the world! You must become a member of Bat Conservation International, $45, in order to visit this site. Reservations are required. C. Camden Street Bridge, San Antonio: No reservations required. Free. D. Congress Avenue Bridge, Austin: Here, you can see the largest urban bat colony. No reservations required. Free. E. Devil’s Sinkhole State Natural Area: Reservations required. The cost is $12 for adults, $10 for seniors, $6 for children ages 4 to 11, and free for children under 4. F. Eckert James River Bat Cave Preserve: Reservations are not taken, except for special group reservations. The cost is $5, but bat-watching is free for children under 5. G. Frio Bat Cave: Reservations required. The cost is $12 for adults, $11 for seniors, military, and first responders, $10 for children ages 6 to 10, and free for children under 5. H. Old Tunnel State Park: Reservations are not accepted except for special group tours. The upper viewing area is free and the lower viewing area is $5. No children under 3 are allowed at the lower viewing area. I. Stuart Bat Cave at Kickapoo Cavern State Park: Reservations are not required but groups may want to consider making advance arrangements. The park entry fee of $3 includes bat-watching. J. Watonga Boulevard Bridge – White Oak Bayou Greenway Trail: Reservations are not required. Free. K. Waugh Drive Bridge: Reservations are not required. Free. L. Clarity Tunnel: Reservations are required. The cost is $10 per person. *This information was accurate at the time provided, but please contact the facilities for the most accurate reservation and pricing information. 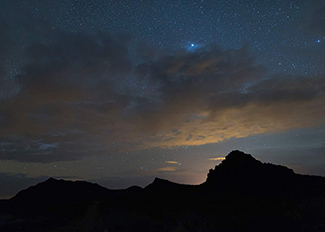 Star gazing is a great way to get outside and avoid the summer heat. However, it can be a challenge in urban and suburban areas because of light pollution. Light pollution makes stars, the Milky Way Galaxy, and other objects in the night sky harder to see. 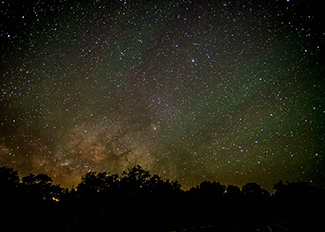 There are numerous Texas State Parks with very dark skies, including class 1, 2, and 3. The sky classification is a rating from 1 to 9, with 1 being the darkest and 9 having the most light pollution. 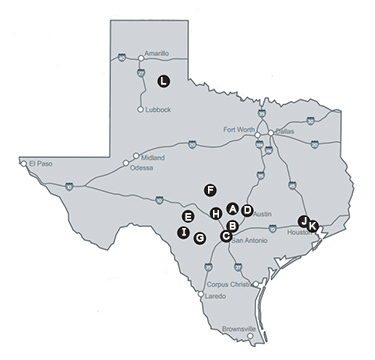 Class 1, 2, and 3 parks are located in Big Bend Country, the Panhandle Plains, and the Hill Country. These parks are the best parks for star gazing as you’ll be able to see many objects in the night sky. Some of them even offer night time astronomy programs. Don’t forget to consider the phase of the moon when planning a star gazing trip. The moon can be so bright that it outshines other objects in the night sky. Class 1: Big Bend Ranch State Park. Class 2: Balmorhea State Park, Barton Warnock Visitor Center, Caprock Canyons State Park & Trailway, Copper Breaks State Park, Davis Mountains State Park, Indian Lodge State Park, Devil’s Sinkhole State Natural Area, Kickapoo Cavern State Park, and Seminole Canyon State Park and Historic Site. Class 3: Colorado Bend State Park, Enchanted Rock State Natural Area, Lost Maples State Natural Area, and South Llano River State Park. TPWD publishes a list of all their state parks with sky classifications. They also offer many stargazing activities at parks across the state.